Homemade Christmas gifts are the most meaningful anyone can receive. 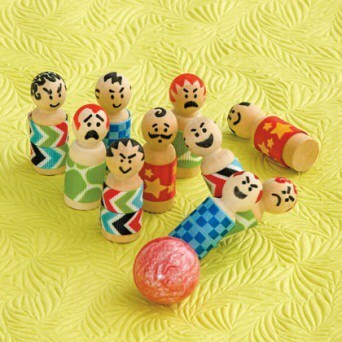 Check out these holiday gifts you can make with your kiddos, depending on their age and ability. Find more DIY gift ideas too! For each sachet, place 2 matching 5-inch fabric squares back-to-back and glue the edges together on 3 sides. Spread the glue close to the edges to prevent fraying. Once the glue is dry, fill the sachet with about 1/2 cup of potpourri. Then glue together the open edges and again let the glue dry. 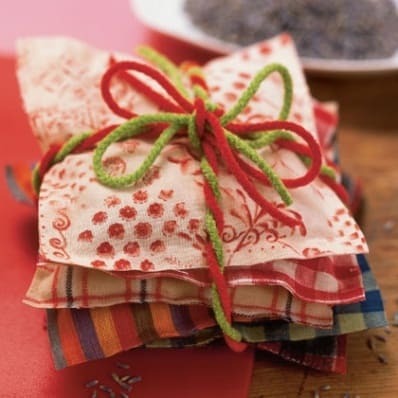 Arrange the finished sachets in multicolored stacks and tie them together with a festive ribbon or yarn. Lay several sheets of newspaper over your workspace area. Pass out one apron for each child who is making an ornament. If you don’t have extra aprons, use some old T-shirts. Instruct the kids to measure and pour 2 cups of baking soda, 1 cup of cornstarch and 1 1/4 cups of water in a saucepan. Heat the ingredients over medium heat on the stove until they become the consistency of dough, stirring continuously. This is your job, Mom. Separate the dough so that each child has his own ball of dough to work with. Allow the children to choose a vile of food coloring to color their ball of dough. Drip five drops of food coloring into each ball and gently fold into the dough until the dough is one solid color. Roll the dough out with a rolling pin to a thickness of 1/2 an inch. Cut out the ornaments with cookie cutters, pressing each one firmly into the dough. Stick a straw through the center tip of the ornament. Remove the dough from the straw. Set the ornaments aside to dry out. This may take several days. Thread an 8-inch piece of yarn or string through the hole you created in the ornament. Tie a knot at the end. 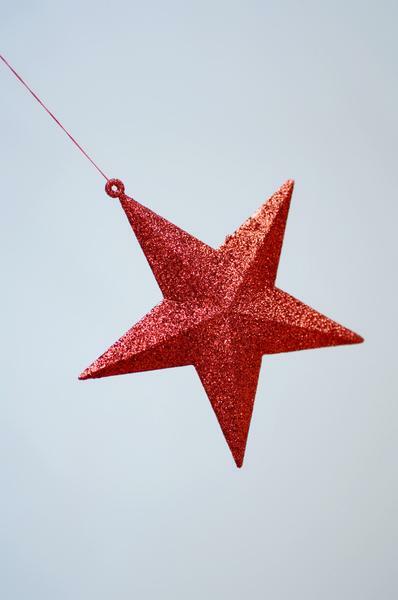 Hang your ornament around the house, or wrap it up as a gift. 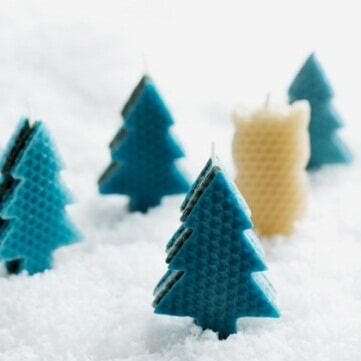 For each candle, use a cookie cutter to make 10 identical shapes from the wax sheets. Divide the shapes into two stacks of 5. Sandwich a wick between the two stacks, starting at the bottom and extending it beyond the top by at least an inch. Press the sheets together gently. If they don’t stick together, take the wax layers apart and use a hair dryer to gently warm each one before restacking them, adding the wick as instructed above. Trim the wick to about a half-inch. Stand your candle up, shaping the base as needed to make it sit securely. For easier dipping and more defined prints, use a brush to smooth the paint on the plate after every few stamps. To start, pour a thin layer of paint onto a plate; use a separate plate for each color. 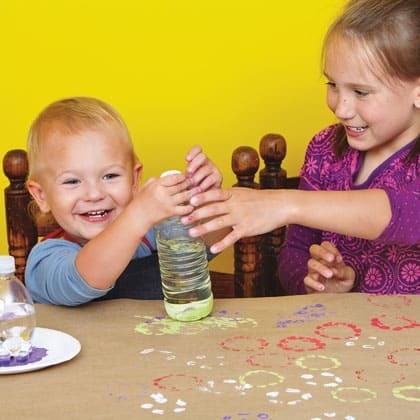 Smooth the paint with the paintbrush, then have your child press the bottom of a bottle into the paint and practice printing on a piece of scrap paper. You may need to help him press the bottle down to get a defined print. Once he gets the hang of it, have him print designs on the object he wants to decorate (put a piece of cardboard or thick paper inside anything made of cloth to prevent the paint from bleeding through). Then with his fingertip or the top of a bottle cap, he can make the flower centers. Let the paint dry completely. Make the necklace base by looping the elastic cord around the washer as shown, then gluing the magnet to the washer. To prevent bleeding or fading, apply a layer of packing tape to the front and back of your artwork or photos. Next, cut the images into circles with the hole punch (or trace a quarter over the image, then trim along the line with scissors). 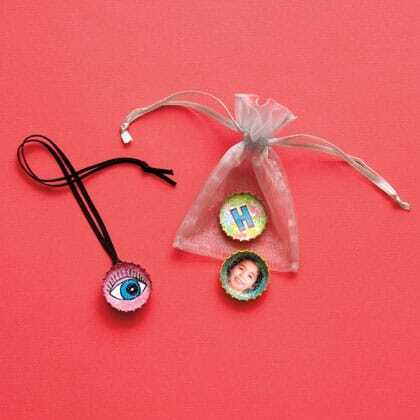 Squeeze a thin layer of glaze into a bottle cap and press one of the cutout images into it. Let it dry, then fill the cap the rest of the way with glaze (adding a sprinkle of glitter first, if you like). Repeat to create a set, then let them dry overnight. For each bowling boy, wrap the ribbon around the body and trim it to fit. Trim a length of tape to the same size as the ribbon, then use it to secure the ribbon to the game piece. Repeat with the remaining game pieces. Fold a sheet of white card stock in half lengthwise, then fold it in half again, short side to short side, and cut along this fold. Repeat with the other sheets to make as many pages as you like. For the cover, fold the colored card stock in half, short side to short side. Insert the white pages between the covers and staple them along the spine. Use the cardboard to trace 2 illustration panels per page. 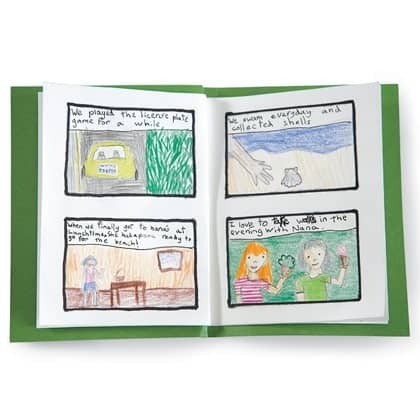 Have your child draw in the panels, then title and decorate the front of the book.